Download APK by selecting “Teacher Loudclass Interactive” under the Interactive sign-in page or by using the provided download URL. Check the APK installation password under “Settings” > “Teacher APK”. The initial APK installation password can be changed by the admin. 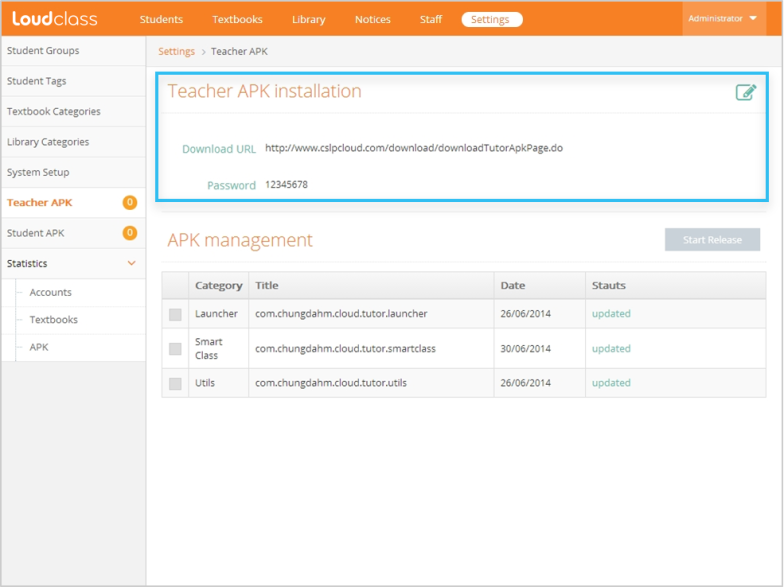 “APK management” shows the list of teacher APKs needing updates in order to use Interactive. The APKs are registered by Chungdahm admin. The organization admin selects the checkboxes of the APKs and then selects “Start Release” when the update is ready for download. Waiting for release : A status for a newly registered APK but not ready for release. Select the checkboxes of the APKs and then select “Start Release” for the update to be applied on the tablets of all the teachers who are using Interactive. Released : A status for the APK that is up-to-date. When Interactive is opened, an update notice is shown on all the teacher tablets and lists the APKs needing to be updated. Tip: Managing student APKs are done in the same method as managing teacher APKs.